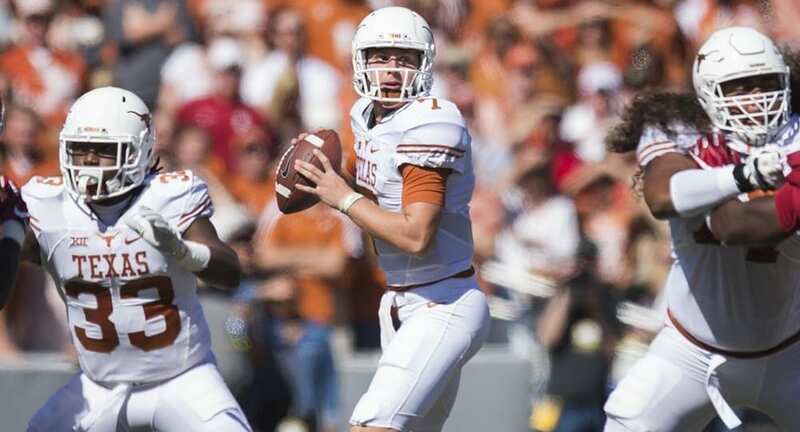 Backup Shane Buechele took over at quarterback after Sam Ehlinger was injured at the end of the first half in UT's victory over Iowa State (photo courtesy of texassports.com). AUSTIN, Texas — If you didn’t see the Texas Longhorns' ringing 24-10 win Saturday over No. 16 Iowa State, before a crowd of 102,498 fans on Senior Night at Darrell K Royal-Texas Memorial Stadium, well then you missed out on the watching the 15th-ranked Longhorns playing their best football of a memorable season, dominating a talented and well-coached opponent in a manner rarely seen on the 40 Acres over the past 10 years. Texas quarterback Sam Ehlinger passed for 137 yards and a touchdown and ran for 32 yards and another score before being injured on the next-to-last play of the first half, but that didn’t stop the Longhorns from walking right through Iowa State while keeping alive their hopes for a spot in the Big 12 championship game. The Longhorns (8-3 overall, 6-2 in Big 12 games) can clinch a berth in the league title game with a win Friday at Kansas, and would play the winner of Friday’s Oklahoma-West Virginia game. UT's eight wins are its most in the regular season since 2013, former coach Mack Brown’s final campaign in Austin. “Winning, winning, winning” — it’s like Herman has suddenly morphed into the happy version of the enigmatic Charlie Sheen. But winning is important, especially when losing had been the norm in the Texas program in recent years. The loss snapped a five-game winning streak for Iowa State (6-4 overall, 5-3 in Big 12 play) and ended the Cyclones’ chances for one of the berths in the league championship game. Ehlinger (who was 12-of-15 in his two-quarter stint) reaggravated an injury to his right (throwing) shoulder when he was hit on a scramble late in the second quarter. His 15 passes without an interception extended to 295 his team and Big 12 record for throws without a pick. Backup Shane Buechele took over behind center to start the third quarter and hit all 10 of his passes, ending up with 89 yards and a touchdown in relief of Ehlinger. Texas outgained the Cyclones, 405-210. Only three of Iowa State’s 11 possessions ended in Texas territory, including its last, which began at the UT 6-yard line after a 47-yard punt return by Tarique Milton and a face mask penalty. Iowa State freshman quarterback Brock Purdy, who had been a catalyst for the Cyclones’ resurgence after a 1-3 start, came crashing down to Earth Saturday against the Texas defense. He passed for just 130 yards and was sacked five times before being removed from the game after a hard tackle midway through the fourth quarter. After stopping Iowa State on the game’s opening drive, the Longhorns moved 80 yards in nine plays to a 7-yard touchdown run off right tackle by Ehlinger. Texas lined up in a five-wide receiver formation on the play, with all the wideouts running into the end zone to clear room for Ehlinger to wait on left tackle Calvin Anderson to pull around and lead him over the goal line, giving the Longhorns a 7-0 lead with 8:50 to play in the first quarter. Iowa State fashioned a 10-play, 76-yard drive on its ensuing possession, with Connor Assalley booting a 40-yard field goal to bring the Cyclones to within 7-3 with 4:47 to play in the first. The Longhorns added to their lead early in the second quarter as Ehlinger found running back Keaontay Ingram wide open in the right flat for a 19-yard touchdown pass. Ingram looked on the play like he was the first player out to practice (there were no Iowa State defenders within 15 yards of him when he caught the ball. His touchdown capped off a 10-play, 94-yard drive. After an interception by UT's Chris Brown at the ISU 36, the Longhorns drove to the Cyclones’ 10-yard line before Cameron Dicker missed wide-right on a 28-yard field goal attempt, allowing Iowa State to dodge a bullet. Dicker made amends on the following drive, converting a 22-yard field goal with 2 seconds to play in the half after an 11-play, 75-yard march, granting Texas a 17-3 lead at intermission. Texas dominated the stats in the first half as well as the scoreboard, racking up a 283-116 edge in total yardage and an 18-minute to 12-minute advantage in time of possession. The only downer of the half came on its next-to-last play, when Ehlinger tried to scramble for a first down and was tagged by Cyclones’ Anthony Johnson, taking a direct hit to the right shoulder that Ehlinger injured earlier in the year against Baylor. When the second half began, Buechele was running the Texas offense. Iowa State had a chance to cut into the Longhorns’ lead but Assalley’s 48-yard field goal attempt clanged off the left upright and fell back onto the field. Texas flexed its muscle on its next drive, mixing runs by Tre Watson with passes to Andrew Beck, Watson and Jerrod Heard to set the table for a 27-yard scoring strike from Buechele to Lil’Jordan Humphrey. Humphrey caught Buechele’s pass at the ISU 13 and literally shrugged off Cyclones cornerback Brian Peavy (who goes 5-foot-9 to Humphrey’s 6-foot-4) before running and vaulting into the end zone to push the Longhorns’ lead to 24-3 with 36 seconds to play in the third quarter. The Cyclones finally got into the end zone with 1:33 to play on a 4-yard touchdown run by David Montgomery after Milton’s big punt return. There’s plenty on the line Friday at Kansas, not the least of which is an attempt to stay on track to reach the stated goal of winning the Big 12.